I met with this 42 year old from Virginia Beach after she had lost over 100 pounds several years earlier. 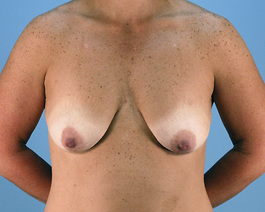 Although she was very happy with her new weight, she was concerned by the loss of volume and sag of her breasts and her loose abdominal skin. 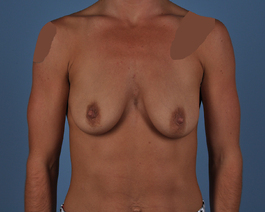 After a thorough discussion, we decided that her best possible result with the least risk would be a breast augmentation with lift in one procedure followed by an abdominoplasty (see Case 190 in the tummy tuck photo gallery) four days later. Because of the time required for these procedures, it is better to do them in stages, several days apart. She was still able to recover from both procedures at the same time. The after photos were taken 1.5 years following her procedure, and this Virginia Beach weight loss patient is extremely happy with her new body contour.